"This is better than the commercial Irish Cream liqueurs and is very popular with family and friends. Will store for several weeks in fridge, just serve over ice." Pour a small amount of whiskey into a large bowl. In the top of a double boiler, melt chocolate, stirring constantly until smooth. Mix the melted chocolate with the whiskey in the bowl. Gradually stir in the sweetened condensed milk and the evaporated milk. Stir in the cream, instant coffee granules, and the remaining whiskey. Pour mixture into 3 (750 ml) bottles, seal and store in refrigerator. Best if kept at least 1 month before using. To serve: shake bottle well, serve in small glasses over crushed ice. 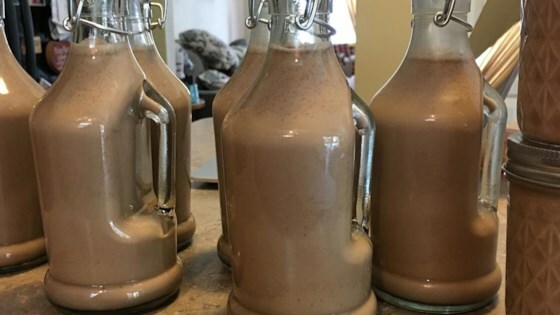 See how to make homemade Irish cream liqueur. Great! Just what I was looking for...but I noticed that the author did not specify when to add the coffee granules. I added them to the melted chocolate and they did not dissolve properly. Seems a long time to keep before you can drink it. All my friends enjoy it and can not keep enough in the fridge.